THE NATURAL HAVEN: The Blog Experiment - pH and your hair! 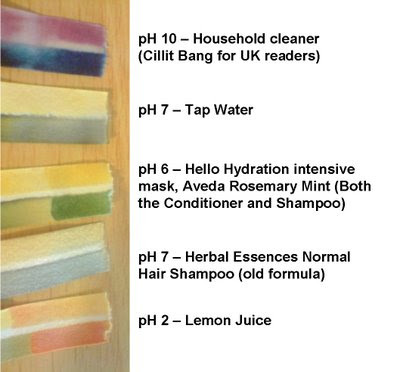 The Blog Experiment - pH and your hair! Please see part 1 - Sodium Hydroxide: Is lye always lye or is that a lie? Mikimu has given me a much needed excuse to do something scientific even if it is just mildly scientific. Well the picture to the right (pardon the camera phone quality, I still haven't charged my camera!) shows you a commercial litmus paper test that my hubby purchased. It shows you pH on a scale from 1-12. pH is a measure of how acidic or basic a solution is. 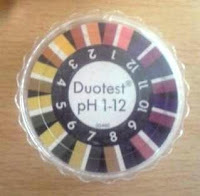 pH 7 is regarded as neutral. Everything below 7 is acidic and the lower it is the more acidic it is. Everything above pH 7 is basic (or alkaline) and the higher it is, the more basic it is. The pH test is a good measure because it makes 'scientific sense'. The scale is logarithmic which means the actual difference between pH 7 and 6 is quite high numerically, however it is relatively meaningless if you want to perform a reaction. Many chemical reactions require substantial differences for example in part 1 we perform a reaction with NaOH ( pH12 -13) with HCl (pH 0-1 ). Another example is relaxer, hair is at a pH of around 5 and relaxer is at a pH of 12-13. So on to the experiment! The litmus paper is a way to measure the pH of a solution. The paper changes colour depending on pH and you then compare the paper to the colour wheel. Well the only product that I could find with sodium hydroxide was my herbal essences hello hydration intensive mask (deeply in love with this stuff). I tested a new jar (for science!! lol ) to make sure that it was not contaminated. I just tested the other stuff because I could and because my hubby got a bit carried away and started pH testing other stuff like his aftershave and deoderant and bleach and pretty much everything else in the bathroom lol. So the results show that pretty much all the hair products in my bathroom are between 6 and 7. As a scientist, this is not really much of a difference. Hello Hydration Intensive Mask has sodium hydroxide and is actually slightly acidic at pH 6, which throws out the idea that NaOH in a products renders it to be of a high pH value. For comparison value, I placed some high and low pH substances from my husband's 'experiments'. Why are these hair products generally around pH 6-7 and hair is at pH 5? The reason is greater than hair. Cosmetic scientists make these products for at home use. They have to consider these products may enter your eyes or mouth. They have to consider the product may wash over your body in the shower. For these reasons, a near neutral product makes sense. 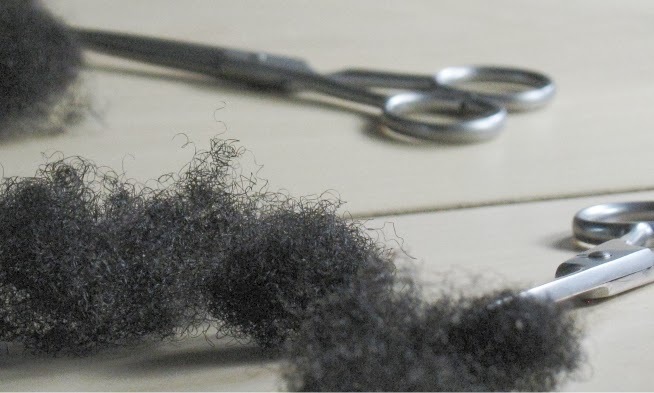 Professional products for use in salons may not take these factors into consideration as the user should have gloves (for relaxers - pH 10-12 or for porosity treatments - pH 2-4) and should be careful not to keep the products on hair and protect the scalp. so then what would be the ph level of relaxed hair since a relaxer has a ph level of 12-13? would it mean that relaxed hair is also at that level? If so would that require relaxed hair to use more or less acidic products to bring it back to the right ph balance? hope my questions makes sense. When you relax hair, you do raise the pH but this is because of the relaxer. The relaxer should be washed off thoroughly with shampoo. Quite often the 'neutralizing' shampoo actually doesn't neutralize anything it just contains a pH indicator. The change in pH by washing away the product is therefore visible. Since the 'neutralizing shampoo' is usually small in the pack, there is nothing wrong with using ordinary shampoo first to wash the relaxer off. You can rinse and repeat several times and then on the final wash use the neutralizing shampoo provided so that you can be certain that the pH is right. Correcting the pH while relaxing hair is as simple as washing thoroughly. Thoroughly means rinse well (upto 15 minutes of running water and gentle scrubbing of the hair), shampoo and lather - allow to sit for 5 minutes, rinse well again (5-10 minutes). Repeat the shampoo step at least 2-3 times. Use the pH indicating shampoo to check. Hah. I've been thinking of testing the pH of every product I have in my bathroom, and I have dozens. Too bad to find it has already been done :P but I'll do it anyway. Just waiting for my new, better ph paper. So products should be around 5 as for as pH goes? Yet, I read something about conditioners that reads "Acidifiers, acidity regulators which maintain the conditioner's pH at about 2.5–3.5. In contact with acidic environment, the hair's somewhat scaly surface tightens up, as the hydrogen bonds between the keratin molecules are strengthened." So, a conditioner should be at 2.5-3.5? Thanks. I googled that sentence and i see it comes from wiki. wiki is a good starting source but remember that it should always be counterchecked as anyone can write it. As explained here conditioners and shampoos tend to be in the pH 6 to 7 range. FASCINATING. Jc, I just love this blog. I've been reading it for about a year now, and I'm still getting schooled all the time by you-- and loving it. I definitely am guilty of having a knee-jerk panic reaction whenever I'd see sodium hydroxide in a product's ingredients, and I'm so grateful to understand better why and how this ingredient is actually used (outside of perms). I also am really interested in how you must utilize drastic differences between acids and bases to truly affect a change on the hair shaft. Do you suppose you could go in depth on whether there really is a difference between a leave-in conditioner that's a pH of 7 vs. one that's a pH of 5 or 4? Being savvy about the pH of particular products seems to be a growing trend in hair care (specifically, afro-textured hair care), but after reading about your experiment, it seems it may not be such a big deal if I use a conditioner or leave-in that is of a pH higher than hair/skin's natural pH, i.e. one that is is more neutral than acidic.